Amongst vintage dive watches, few are as delectably cool as the dual-crown “super-compressors” (though only some are actual super-compressors)… in fact, we like them so much here at worn&wound that we have a whole article dedicated to them. Dual-crown divers have a certain refinement to them, balancing sport and more formal elements in, typically, compact cases. The results are true gentleman’s sport watches, with an elegance that modern divers rarely meet. Unfortunately, they are few and far between, and though were once meant for the water, these days are better kept dry due to their age. So when a brand comes out with a modern dual-crown watch, it always piques my interest. A few months ago, G. Gerlach announced their Navigator model, and I immediately knew I had to review it. 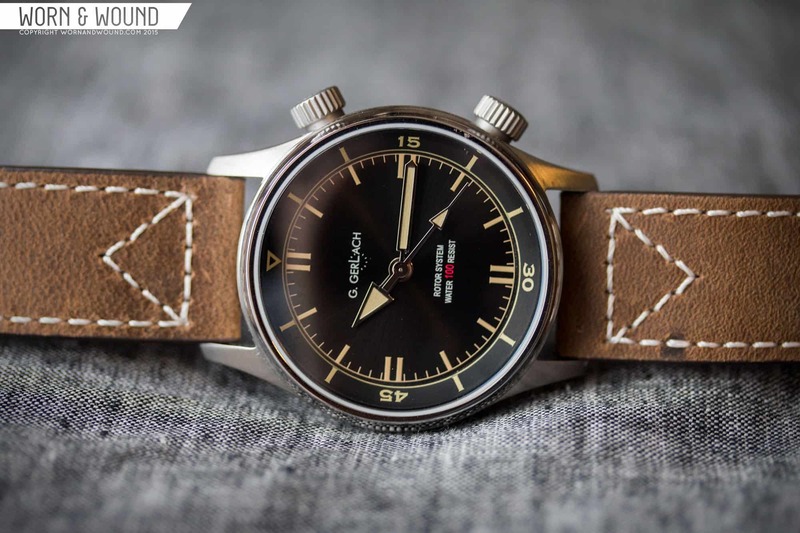 Not only did the pictures suggest that the watch had a great look, one that drew on vintage dive watches, but coming from Gerlach, I knew the pricing would be great too. Immediately out of the box, I was impressed by the style of the design. It’s subtle, but uses some nice coloring and texture to add intrigue and a vintage feel, though with a modern case size of 42mm. To be honest, while I always thought of it as a dive watch, seeing it in person, it felt more like a pilot, or some hybrid of the two. Inside, the Navigator is powered by a Seiko NH35A automatic movement, which is a trusted workhorse. I imagine a lot of people will be pleased to see the Seiko here rather than the SeaGulls Gerlach used before. Throw in a sapphire crystal with AR and the price of 1399 PLN, or about $375, and you have a compelling package. The case of the Navigator is pretty straightforward, though it has a couple of details that make it shine. Measuring 42 x 52 x 13mm, the case has a modern sport watch build that while large on paper wears much smaller. That said, I am a bit torn on the size. One of my favorite aspects of some of the original super-compressors is that they wore so well at 36mm. The lack of an external bezel letting the dial be larger, thus the whole watch wearing a bit differently. Of course, a few, like the JLC Polaris and Bulova, were actually in 42mm cases. Either way, Gerlach was not trying to make a replica of a vintage watch, so much as a contemporary watch with vintage cues, so I understand the decision, though 38 or 40 might have been a happy medium. But, back to the case, the design is clean and attractive with long, contouring lugs and slab sides all with an even brushing. It looks more like a pilot case than a dive case, tas it has those lines and a sort of military simplicity. My favorite feature is the bezel, which is polished and has a concave radius to it, which gives it a unique look. On the right side are the dual crowns at two and four for the internal bezel and time respectively. They are nice and large, measuring 7 x 4.6mm, standing off of the case a few millimeters, both in matte steel. On the slightly domed outer surface, they are both etched with some art, the word “Navigator” in a ring on the 2 o’clock crown and the Gerlach “G” on the four. Neither crown screws in, giving the watch a 100M WR. While I personally don’t get my watches wet, with a modern made sport watch, especially one with dive roots, I’d like to see 200m+. Though 100M is still fine for most daily contact with water, and perhaps even swimming (keep in mind that water pressure increases as you move your arm through it) it just seems to make the watch more of a style piece than a practical piece. That said, this is only a concern if that’s how you want to use it, and like I said, there is an overall pilot feeling to the design. The internal bezel is a non-ratcheting bi-directional type. You simply turn the crown to position the origin where you see fit, or leave it at 12 to have a minute index. The feel of turning the crown is good, nice and smooth, though I did notice some play in the bezel itself. As I turned it, especially counter-clockwise, I saw the whole bezel shift slightly to the left. Once done turning, it’s hard to tell that it moved. Whether this was just the sample watch or an issue with the design, I don’t know, but it seems like it’s a place for some improvement. Flipping the watch over, you have a solid steel, screw-down case back with some nice etching. There is a big compass shape with a Gerlach “G” in the center, and various details inscribed around the edge. The dial of the Navigator is minimal and attractive, with nice coloration and details. The main surface is sun-ray black, which is unexpected as matte is a far more common choice. That said, I really like that it’s in use here, as its fairly subtle, giving the dial a bit more depth and texture. On this surface is a primary index of parchment colored lume rectangles, double at 12, 3, 6 and 9, single on all others. One little detail about these that is hard to notice, is that at the end, they flair out ever so slightly with a sort of serif, giving them a column-like shape. In between each hour marker is a small line for the minutes/seconds, also in a parchment color though not lumed. Connecting them all is a thin line on the very outer edge of the surface. Just below twelve is white text reading “G. Gerlach” and just above six are two lines, the first saying “Rotor system”, their way of say automatic, the second reading “Water 100 resist”. All of the type is white say the “100” which is larger and bright red. I do very much like an occasional red highlight like this, and in this instance it does nod to vintage sport watches. The internal bezel is matte black with column-rectangles at intervals of five, numerals at 15, 30 and 45, and a triangle at 0/60. The rectangles continue the flow from the hour index, while the numerals create a needed break from the repeated shapes. When set at the origin, the bezel and dial have a very nice relationship. All of the markers on the bezel are also lumed, providing decent legibility in the dark. The hands of the Navigator are a lot of fun. The minute hand is a straight sword while the hour hand is simply a massive triangle. Both are polished stainless with cream lume filling. The hour hand in particular is very cool, with a design that one really would only find on 60’s divers. The second hand is then a broad stick with a lumed triangle 1/3 from the end, which matches well with the other two. The Navigator features a 22mm medium brown leather strap. It’s thick, straight cut with a matte, oily surface, and contrast white stitching with a triangle detail by the lugs. It’s a very nice strap that does suit watch, once again bringing out the pilot feeling. The rugged leather works well with design and size of the watch, making it feel nice and sturdy, while the color perfectly accentuates the parchment lume and balances the black dial. Finishing the strap off is a matte steel pre-v style buckle. Normally, I’m not a huge fan of these as they can be huge, but this one is relatively small, so it looks fine. This watch really looks great on the wrist. While I might have liked to see a smaller size for a more vintage feel, as is, it works. The proportions of the case to the 22mm lugs/strap, plus the relatively large dial/bezel make it wear smaller, but in a way that feels compact and solid. On my 7″ wrist, it fit nicely for a somewhat larger watch, the lug-to-lug being on the limit of what I can wear. Though I think I relate it more to vintage dive watches because of the dual crowns and hand design, in reality it looks and feels more like a pilot, but a different take on one. In fact, if you can sort of forget the super-compressor association all together, and just think of this as a curious modern sport/pilot watch, I think it becomes all the more enjoyable. When looking at the watch as a whole, the palette really comes together. It has a sort of dusty, worn in look, like it’s been somewhat aged, but not in a fake way. The sunray dial makes it a little lighter than other blacks, while the parchment lume as a sort of tropical feel. The choice of strap was really perfect as a starter for the watch, as it matches the aesthetic nicely, but is much more interesting than your typical stock strap, so you’ll want to keep it on. It also just give it a very rugged and masculine look that works well with casual clothes, especially denim and worn in leather. I think in the process of reviewing G Gerlach Navigator, I grew to understand it better. At first, I approached as a throw back to the super-compressor divers of the 60’s, but now I see it really has its own identity, and a strong one at that. It’s a well styled sport/tool watch with a unique look that rides between a diver and pilot. There is something military about it, though not overtly, and it’s thoroughly masculine. Other than the one issue I had with the internal bezel having some play, which didn’t effect my normal use of the watch, it’s well made. And with a sapphire crystal and the Seiko NH35A movement inside, the value at $375 is very good. Once again, G Gerlach has shown that an independent brand based in Poland and manufacturing in Poland can make a very cool, affordable watch.